Chances are, if you have switched on the television lately, you may have noticed that adults over the age of 60 are often depicted as depressed, lonely, ‘grumpy old men’. Yet switch the channel and you are also bound to find images of older adults as sweet, loving grandparents, akin to the ‘golden girls’. So is later adulthood a time of hopelessness and despair, or the prime of life? It’s no secret that older age is associated with widespread decline and undesirable changes. A full head of hair thins out and randomly distributes to strange places on one’s body (like in the ears!). Skin droops and wrinkles, eyesight becomes less acute, and hearing requires extra effort. In addition to the prominent changes in physical appearance, health issues become more common and memory gets fuzzier. Prominent theories of ageing in the 1980s therefore suggested that emotional experiences would follow a similar pathway toward dysfunction. They were wrong. In a 2011 study by Laura Carstensen and colleagues, participants carried beepers around with them during their everyday routines for one week. The beepers would go off at random times throughout the day as part of an experience sampling study, and participants reported their emotions at those moments. This procedure was repeated five and 10 years later on the same participants. It turns out that across adulthood, negative emotions (like anger) wane, and positive emotions (like contentment) become more prominent. In very late life (in the eighties and beyond), this pattern reverses slightly, but never to the same low levels observed in younger adulthood (in the twenties and thirties). Much to the surprise of many gerontologists, these findings have been replicated in both cross-sectional and longitudinal studies all over the world. Why might this be the case? Our social ecology also shows pronounced changes in later life. Work demands are eliminated after retirement. Daily activities become routine and predictable. There is more time for leisure pursuits like gardening, travelling and volunteering. And older adults structure their physical and social environments in ways that reduce the occurrence of unnecessary stressors. My colleagues and I have analysed some daily diary data of women who recently relocated and found that not only do the oldest women in the study report the lowest number of daily stressors (such as getting stuck in traffic, getting into arguments with others), but that this partially accounts for lower levels of negative emotions with age. It appears that avoiding stressors in the first place is a good place to start when it comes to cultivating happiness. Moreover, as we age, our time horizons shrink – we perceive that we have increasingly limited time left on Earth. According to Carstensen’s socioemotional selectivity theory, these shifts in our future time perspective lead to a reprioritisation of the goals that are most important to us. We learn not to sweat the small stuff and to spend our precious remaining time on the things that matter most to us: we hug our grandchildren a little tighter, let arguments pass, and work on checking things off the bucket list. So, getting older means we work toward goals that bring us happiness and contentment. For younger people, conversely, time may seem more open-ended, which can lead to a greater investment into long-term goals, like working on a college degree and moving up the career ladder. Often, however, achieving such long-term goals requires some personal sacrifices (e.g. struggles to balance work–life issues) and exposing oneself to more stressful experiences. College, for example, involves taking heavy course loads, completing numerous exams and assignments, and navigating new social and academic experiences for several years. Many young adults take on these challenges for the chance to hold a coveted graduate degree, but you would probably be hard-pressed to find many 90- or 100-year-olds who would be willing to sacrifice the next four years of their lives to achieve the same goal. Not only are older adults more likely to work on goals that make them happy than are younger adults, they are also more realistic with their goals and what it means to be happy. For example, a 2013 study by Susanne Scheibe and colleagues asked participants between 18 and 93 years of age to report on positive emotions (e.g. excitement, calm) that they would ideally like to feel. Using a similar experience sampling strategy as described above, participants reported how they actually felt at random times throughout the day for seven days. The researchers found that older adults valued ideally experiencing low-activating emotions (calm, relaxing) over highly-activating emotions (excitement, pride), whereas younger adults valued both types of positive emotions equally. Given that older adults more often experience low-activating positive emotions than high-activating ones, their emotional goals (i.e. what they ideally wanted to feel) closely matched with what they actually experienced in daily life. For younger adults, they had a larger mismatch between their ideal and actual positive emotions in daily life. In other words, younger adults set goals that are more difficult to achieve and subsequently, are less likely to reach their emotional goals. Other studies, such as those by Michaela Riediger and her colleagues, corroborate these findings: younger adults are more likely to say they want to maximise their positive emotions, whereas older adults are more realistic in their goal-setting and say they simply want to maintain (as opposed to increase) their levels of happiness. These findings suggest that older adults are happy with being happy enough, which, ironically, might actually make them happier. The same study by Riediger and colleagues also found that teenagers and younger adults were more likely at any given moment throughout the day to say they wanted to increase their negative emotions. This finding is consistent with stereotypes of the angsty, brooding teen wrestling with her emotions. So, while older adults were content with being just ‘happy enough’, they were unwilling to experience much, if any, negative emotion. These results help us understand how emotional goals (what we want to feel) can shape what we actually feel. In a recent study I conducted with Michaela Riediger and colleagues, we found that negative emotions are not always bad for our health and wellbeing. It is true that by and large, experiencing excessive negative emotions can be distressing and can lead to poorer long-term physical and mental health. Yet, individuals who had a greater appreciation for negative emotions and recognised that they sometimes have value were less likely to have health problems when they experienced negative emotions. In other words, how we make meaning from our emotional experiences can shape what kinds of consequences those emotions will have for our health. Perhaps for older adults, negative emotions are so potent that they do not have many redeeming qualities, and are therefore avoided at all costs. More studies are needed to disentangle how these processes change with age. Think about the last time you had a big family gathering. Now imagine that your grandmother makes an inappropriate political or racial comment. Would you confront her about it? What if your teenage cousin made the same statements? Would you act differently? Although older adults proactively shape their own personal networks to maximise their remaining time with loved ones, their social partners also provide older adults with preferential treatment that contributes to older adults’ greater emotional satisfaction. An elegant series of studies by Karen Fingerman and colleagues has shown that social partners are less likely to confront older adults, even when the older adults may be at fault. Younger adults, on the other hand, do not get the same benefit of the doubt. Older adults are also more likely to be forgiven for social transgressions compared with their younger counterparts. This finding may explain why, in part, older adults are more satisfied with their social networks and report more warm and enjoyable interactions with their friends and family members, compared with younger individuals. Older adults generally have smaller social networks, but they tend to be more tightknit. That is, the quality, and not necessarily the quantity, of partners makes social relationships, and therefore emotional experiences, more rewarding with age. In short, older adults are more likely to have close social partners who shape the social interactions in ways that are less caustic and hostile and more warm and understanding. Relationships, however, are a two-way street, and it is not just social partners who de-escalate conflicts with older adults; older adults are also rather adept at avoiding conflicts with loved ones. Older adults tend to have known their partners longer and have more intimate knowledge about what makes their friends and family tick. In essence, they know how to keep the peace, which is critical for maintaining high levels of wellbeing. Even in the best relationships, however, conflicts and disagreements arise. 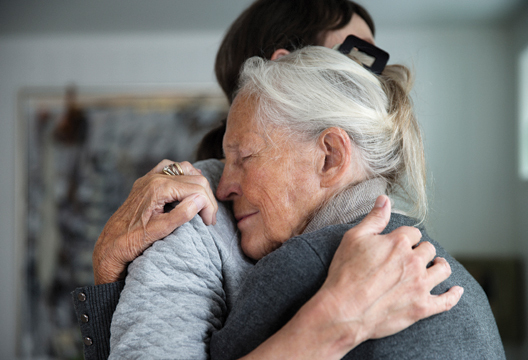 In many of these situations, older adults use emotion regulation and coping strategies aimed at promoting harmony in the relationship and neutralising feelings of anger and resentment. In a recent study I conducted with Susan Charles, we found that this effect even extends to strangers. Younger (18–30 years old) and older adults (60+ years old) discussed hypothetical dilemmas with a stranger that they believed was another research participant in the study. In fact, this person was a confederate (i.e. a member of our research team who was planted in the study). The age-group and gender-matched confederate was scripted to act in an unfriendly and disagreeable manner toward the participant. During the social interaction, we monitored the pulse rate and blood pressure of the partners. Participants also reported their negative and positive emotions before, immediately after, and 20–30 minutes after the task. We found that relative to the younger adults, older adults showed smaller increases in their negative affect, pulse rate, and blood pressure during the negative social interaction. These effects were explained, in part, by the fact that older adults appraised the confederate and task in a more positive light. This was rather surprising, given that coders blind to the hypotheses rated the negativity of the younger and older confederates’ behaviours toward the participants in similar ways (which is exactly what they were trained to do). Thus, emotion regulation strategies of positively reframing argument situations appear to be used more effectively by older adults, which ultimately contributes to less affective and physiological reactivity. Of course, there are exceptions to the rule. Some adults are ‘grumpier’ than others, especially those who are facing progressive physical or cognitive decline (e.g. dementia, Parkinson’s disease), chronic stressors (e.g. health conditions, caregiving responsibilities), or loss of social belonging – risk factors that become more prevalent with age. On average, however, emotional experiences become more positive and less negative with age as a result of changes in one’s environment, including how social partners interact with older adults, as well as in the behaviours and cognitive emotion regulation strategies that become more prominent and effective with greater life experience. In summary, we may look forward to some of the best years of our lives as we age.